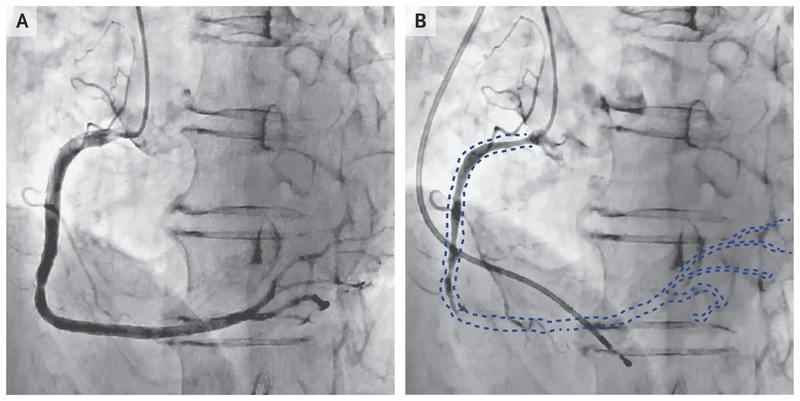 Dr Takeshi Kondo at Chiba University Hospital, Chiba, Japan and colleagues have reported a case of coronary-artery vasospasm that has appeared in NEJM. Coronary artery vasospasm (CAVS) is a constriction of the coronary arteries that can cause complete or near-complete occlusion of the vessel.CAVS appears to be a heterogeneous disease but does not follow the traditional risk factors in the development of coronary artery disease.It is highest between the ages of 40 and 70 and tends to decrease after 70 years. The distribution is varied throughout the world, with the highest incidence noted in the Japanese population when compared to the western population. CAVS induced pain can appear at rest and particularly between night and early morning and can be accompanied by low exercise tolerance, especially in the morning. According to history, a 52-year-old man a smoker with a history of 34 pack-years of smoking presented with a 1-month history of episodic chest pain. The episodes occurred once every night while the patient was at rest, lasted for 15 minutes, and resolved without intervention. Sublingual nitroglycerin was administered, which led to the resolution of the pain. All the findings including a troponin I test, electrocardiography, and echocardiography were normal. 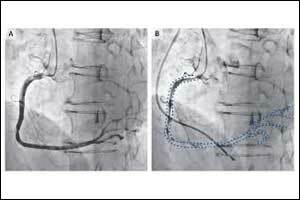 His Cardiac catheterization was performed, and the findings showed mild nonobstructive coronary stenosis in both the right coronary artery (Panel A and Video 1) and the left coronary artery. Injection of acetylcholine into the right coronary artery provoked a vasospasm that led to total occlusion of the proximal right coronary artery (the dashed lines in Panel B outline the area in which the contrast agent is shown in Panel A was absent; see also Video 2); the vasospasm resolved in 2 minutes. During the spasm, the patient reported chest pain, and electrocardiography revealed ST-segment elevations in the inferior leads and reciprocal ST-segment depressions in the anterior leads. A diagnosis of coronary-artery vasospasm (formerly called Prinzmetal angina) was made. Coronary-artery vasospasm is characterized by episodes of nitrate-responsive angina during periods of rest, transient ischemic electrocardiographic changes, and angiographic evidence of coronary artery spasm induced by vasoconstrictors, such as acetylcholine. Oral nifedipine was prescribed, and the patient was advised to quit smoking. At follow-up 2 years later, the patient reported adherence to the medication and to the advice to quit smoking and reported no further episodes of chest pain.